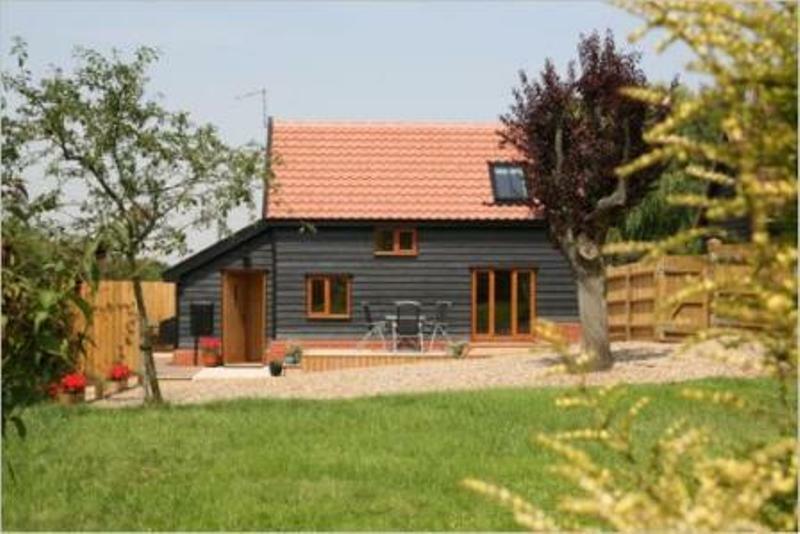 Barn Cottage is finished to a high standard and is available for rental by the week or month (3-night breaks available off-peak). It is situated in the beautiful market town of Framlingham in Suffolk and is a very short walk from the Castle meadows. The cottage accommodates four people in two large bedrooms (one double, one twin) and has a large open-plan living and dining area, a fully fitted kitchen, two shower rooms, a reading room and a large garden with plenty of parking space. Ground floor - Large open-plan living room with 3-seater sofa and two tub chairs, TV with flat screen and DVD, remote controlled wall-mounted fire. Dining table and chairs. Fully fitted kitchen with dishwasher, washer/dryer, fridge/freezer, microwave, toaster, oven and ceramic hob. Double bedroom with bedside tables and wardrobe. Fully tiled wetroom with shower, sink, WC and bidet. Oak staircase leading to the first floor. First Floor - Large twin bedroom with cupboards, drawers and bedside table. Small washroom with WC, sink and shower. Reading/dressing room with writing table and storage cupboard. Services - Wooden floors and underfloor heating throughout. Large garden, decked area to the front and side of the property with garden furniture. Ample parking. Other - WiFi throughout, bed linen, towels, BBQ (Summer months).